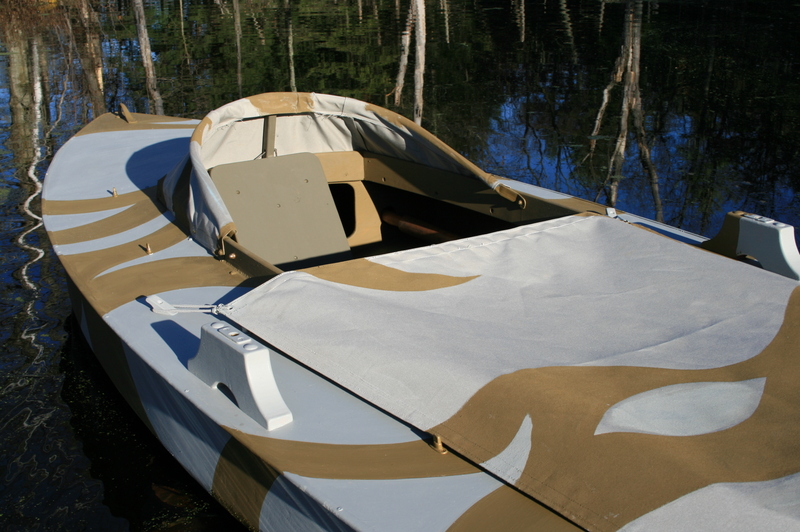 Just by coincidence – a couple of days before I retired from my 35-year career as a wildlife ecologist – I received a call from an old friend, Paul, asking for advice on how to convert a Sunfish hull to a layout boat. 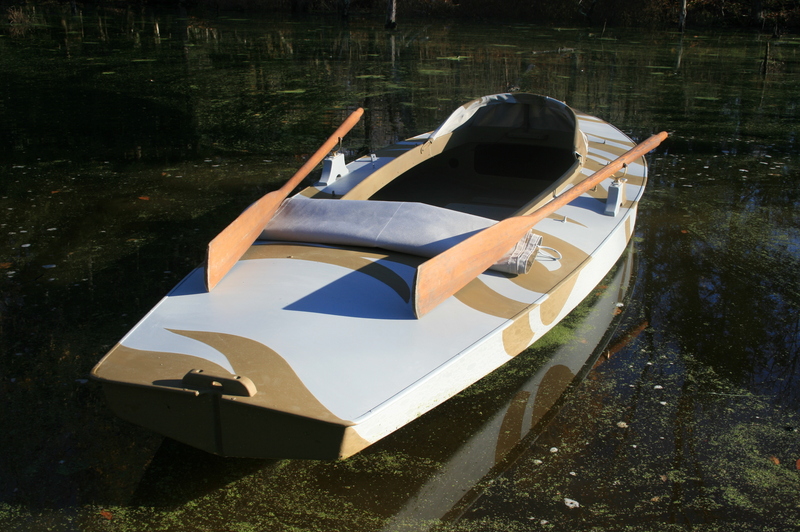 He remembered a boat I had converted a Minifish for another friend, Ed Feeley. 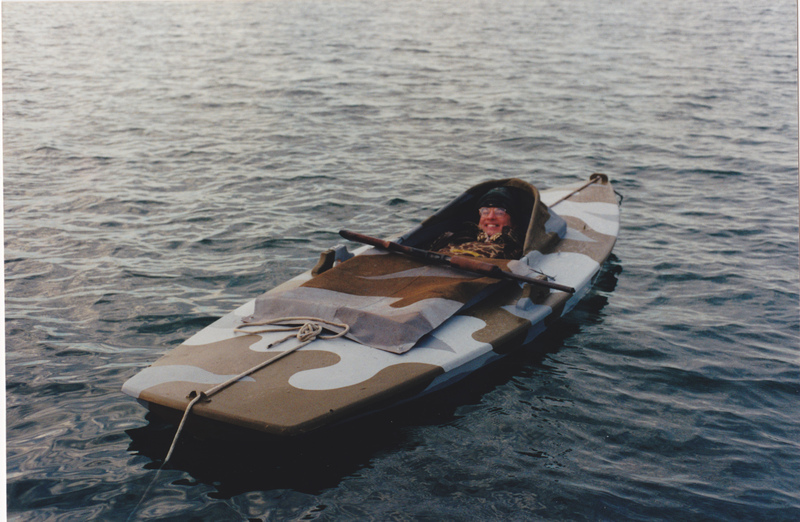 That’s Ed below, enjoying the maiden voyage in his boat circa 1997 (?). First, I put a few ideas down on paper and sent them to Paul. 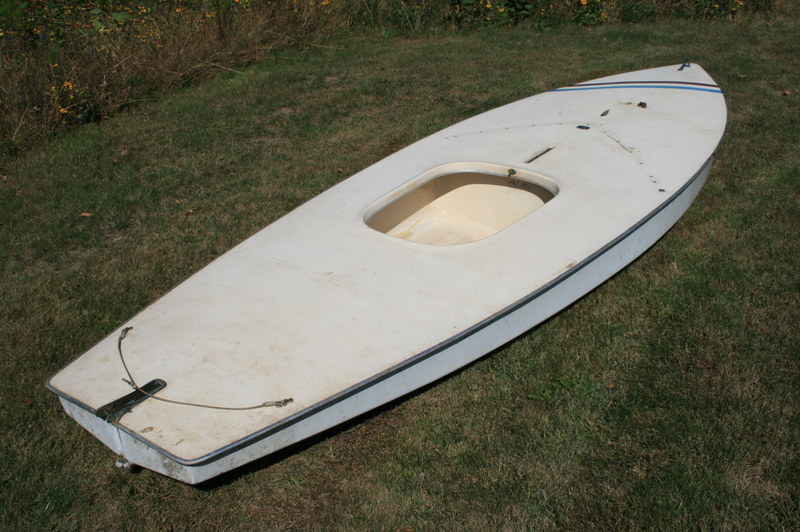 Then, having a spare Sunfish hull resting comfortably in the “marina” here at Pencil Brook Farm, I jumped at the chance to actually do the work. 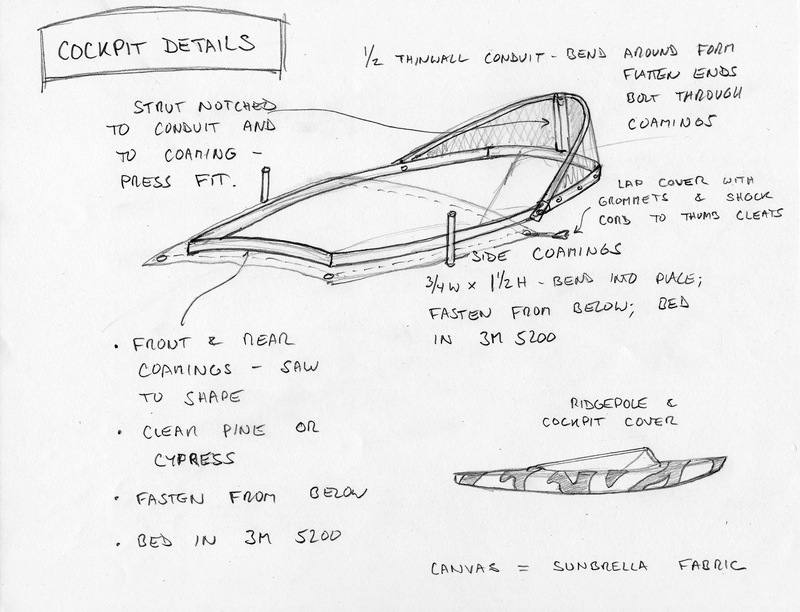 As the first boat project in my new shop, I set to work right away and brought it down to Long Island the next month. 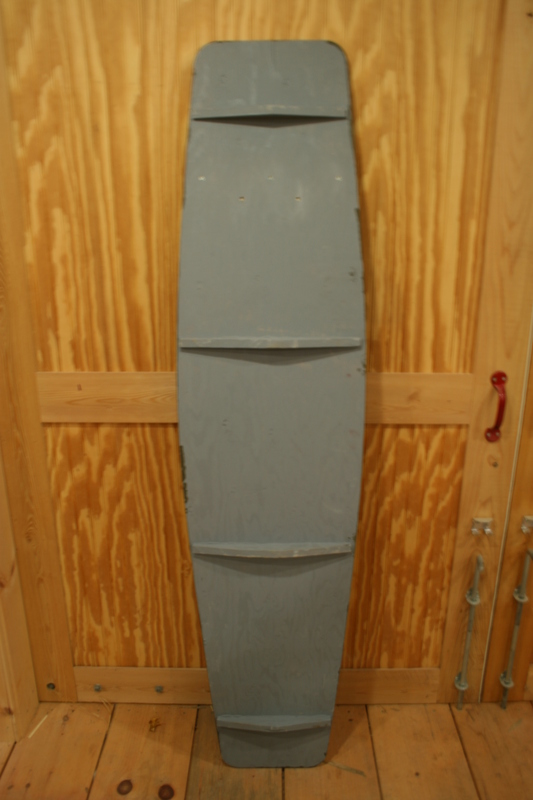 Here is the hull ready for surgery. The cockpit in the “ready to shoot” mode. 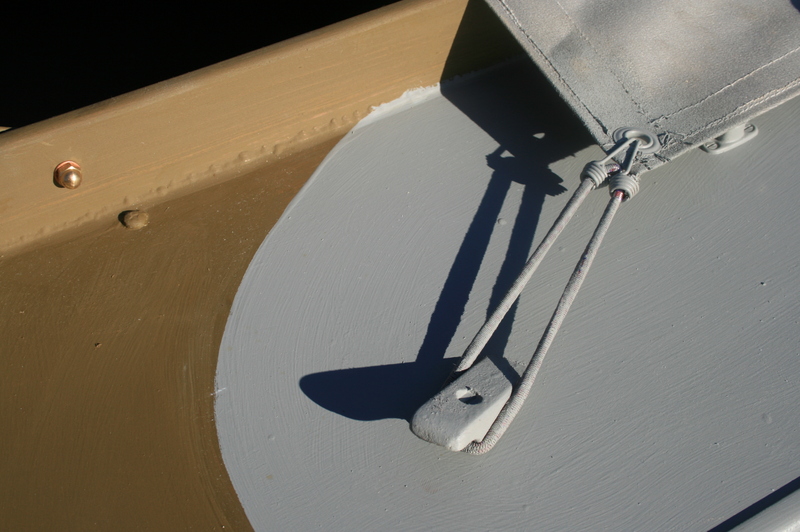 Cowling folds down for transport and storage but is held up with a strut to keep wind and spray off the gunner’s neck – and to hide his silhouette. The shooting cover – which hides the gunner and keeps him warm (?) and dry, is held in place with shock cord on thumb cleats – so it gives when you sit up and can be released in an instant. 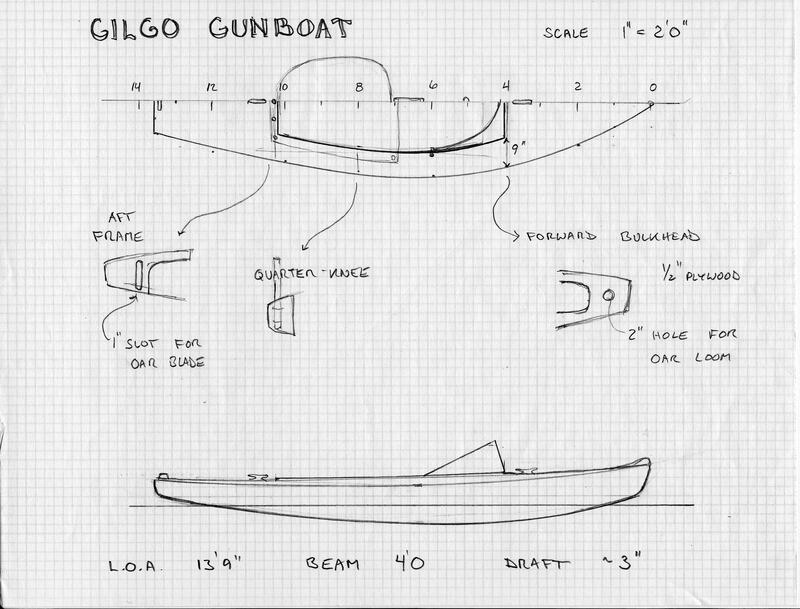 The cleats (frames) on the bottom of the floorboard were scribed to the hull contours. 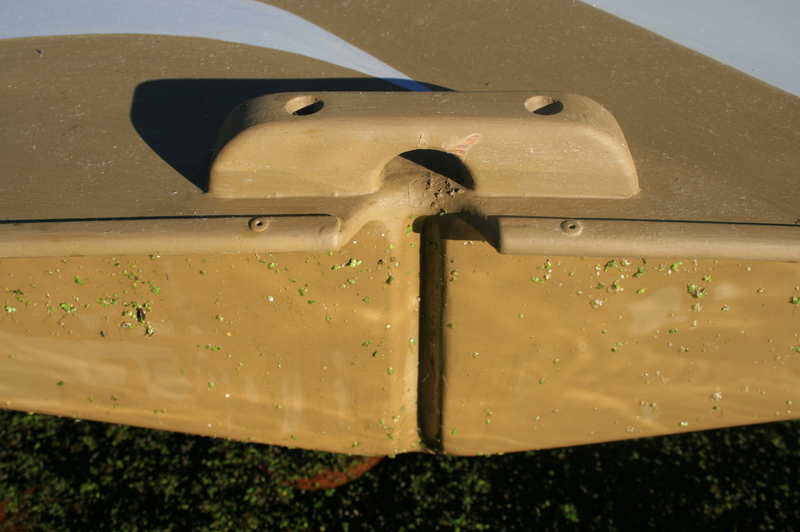 Note the oar stowed in the bulkheads, the strut for the cowling – tied to the bulkhead so it cannot get lost – the chock for the backrest, and the cowling folded down for storage or transport. 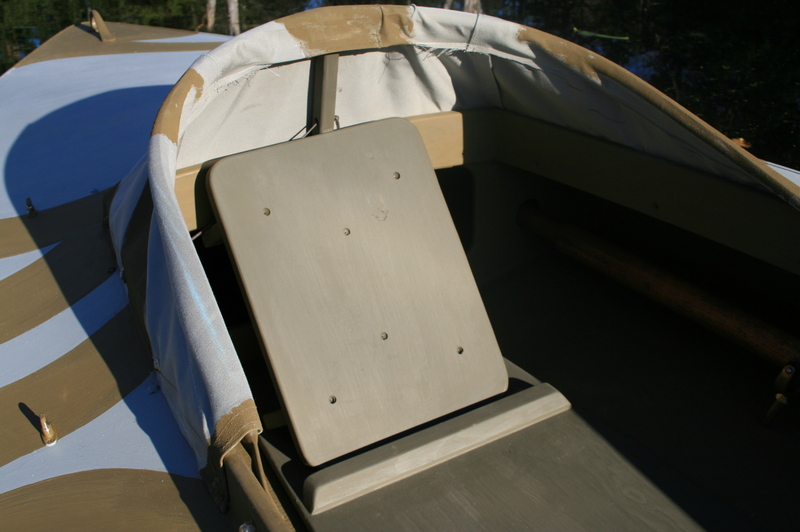 The backrest is held in place by the chock on the floorboard. 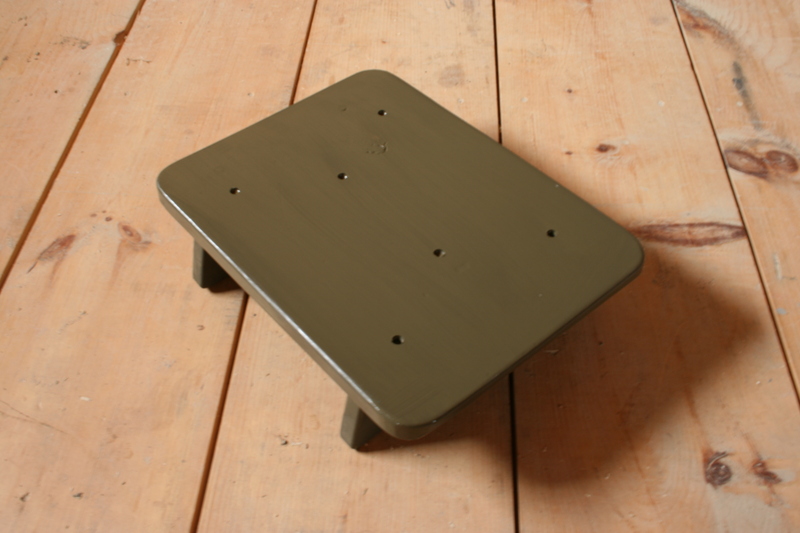 The backrest doubles as a low stool for when rowing long distances. 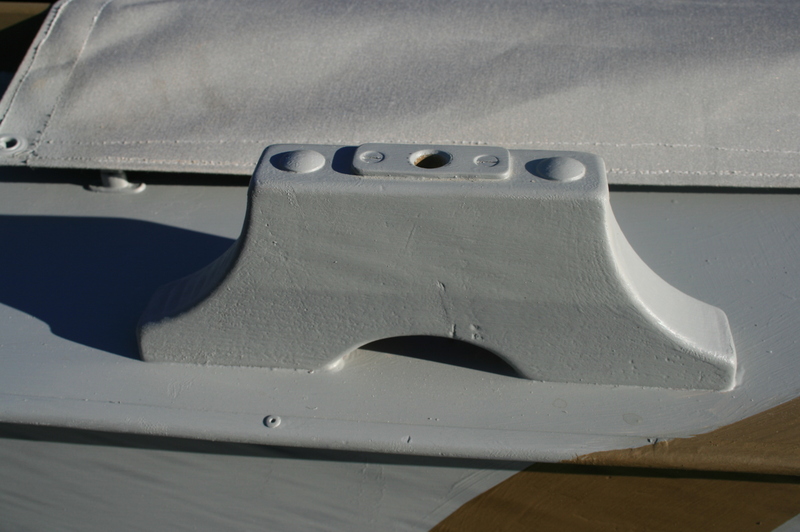 The fairlead at stern keeps the line to the stern anchor (usually a mushroom) in place. Also, the stern line should have either an eye splice or figure-eight knot to prevent it from escaping through the fairlead (Yes, a young Steve Sanford lost an anchor that way….). 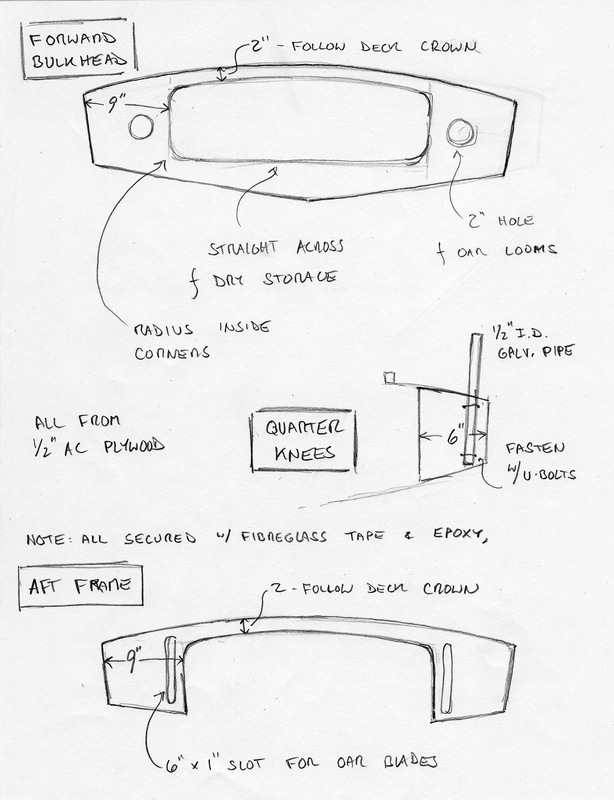 Although my sketch had shown pipe oarlock stanchions, I instead went with conventional wooden ones, through-bolted to a beveled backer below the deck. Here she is ready to row. 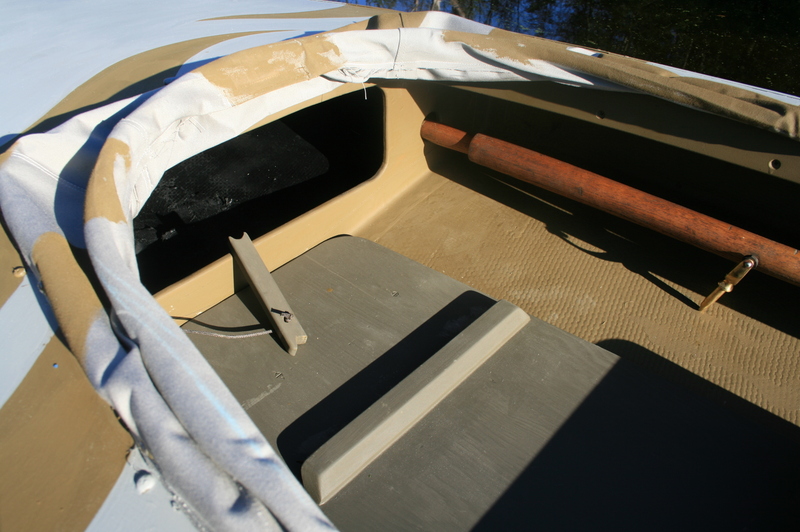 Shooting canvas is rolled back onto rear deck, pinned oars are in stanchions. 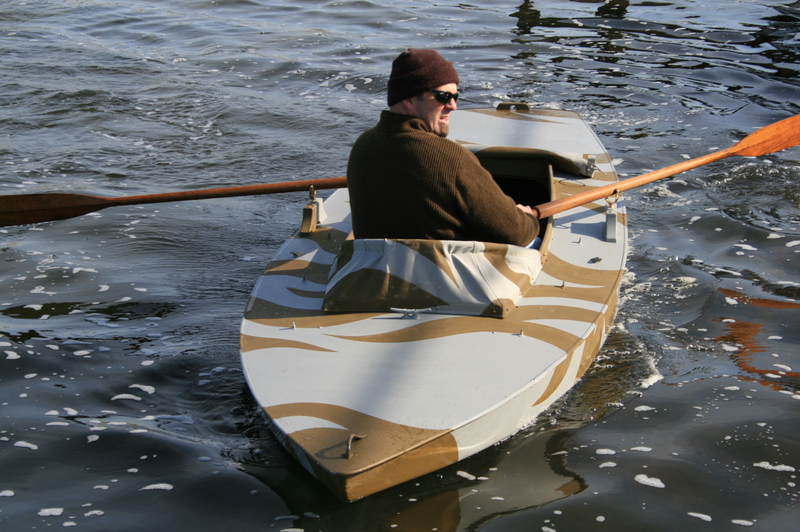 Although many prefer oars that can be feathered, it is tough to do in narrow craft like this. I learned to row alternate-handed in a scooter and so do not miss the feathering. 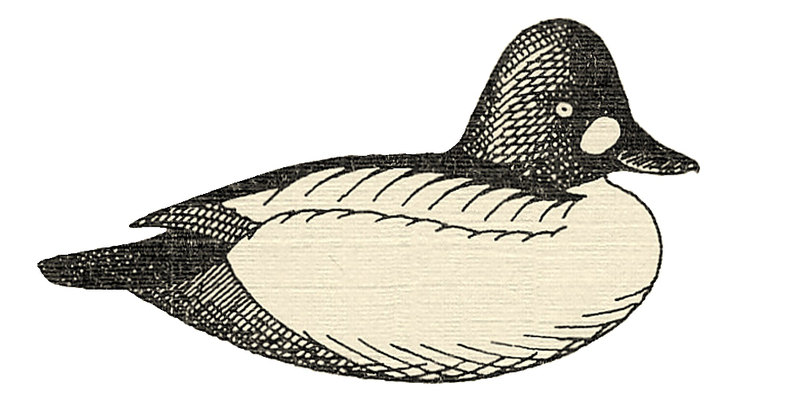 More important, I like to be able to let go of an oar without worry when I need to pick up a downed bird or a decoy. Here is the happy helmsman during sea trials – at least the real sea trials – on salt water. Floating in my Hemlock swamp does not really count for this type of craft.